A garden coach is someone who is experienced and knowledgeable about garden plants, proper soil requirements and the importance of good drainage. They should have an 'eye' for design and will be able to advise you, the homeowner, regarding individual plant care or work with you to help realise a beautiful outdoor space. They would also be able to help and advise you on "hard-scaping" and garden fixtures such as water features. A garden coach can be on-site to work with the home owner on a weekly basis, if needed. 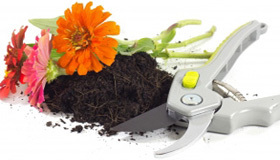 Garden coaches help people to become better gardeners by giving personalized advice and hands on help. Coaching is especially helpful for new home owners who need to know what the have in their garden and how to care for it. Experienced gardeners who want feedback on new garden projects they're planning would also find the assistance of a garden coach invaluable. A garden coach points you in the right direction and shows you how to get started. "We were not gardeners, before it was just something I walked past. Now I enjoy looking at my garden, and actually doing things." What to look for in a garden coach? A garden coach should be an experienced "hands-on" gardener who has studied horticulture and knows all about PLANTS and their care. Latin names of plants should be able to be provided. Have you ever planted something that ends up too large for its position or just fails to thrive at all? It's frustrating, time consuming and can be expensive. A garden coach is the 'expert' you need to help you make the best choices by taking all the elements into account. Why would I hire a Garden Coach? You might find it very useful to hire a garden coach if you are faced with having to come up with a totally new garden design and don't know how or where to start. You may have a special project that you have already started but things seem to have ground to a halt. Lester says,"I have had clients come to me after spending thousands of dollars on a garden design ALONE that they don't like or can't manage, and then have nothing left to purchase plants". With the help of The Garden Coach from the beginning you get the benefit of DESIGN experience, PRACTICAL help AND PLANT expertise all for a reasonable price. Your coach will help you to come up with a plan, a strategy and a schedule, overcoming obstacles along the way. To make an enquiry with Lester Brice | The Garden Coach, click here.